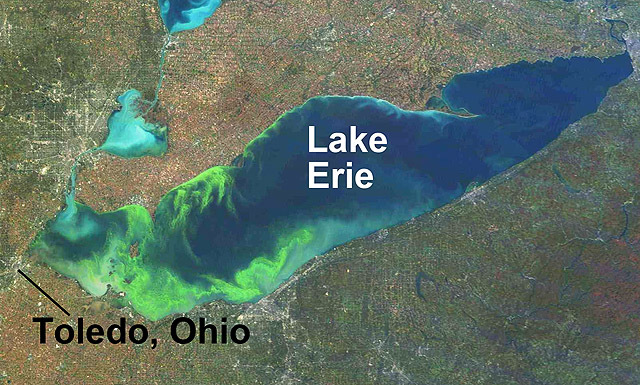 This satellite view shows a large algal bloom in Lake Erie during October, 2011. The algae in some blooms produce toxins that threaten drinking-water supplies for cities such as Toledo, Ohio. Image courtesy of the National Oceanic and Atmospheric Administration. Algae, especially the microscopic algae known as phytoplankton, are significant components of the ocean’s ecosystem. These single-celled “plants” use sunlight to create biomass; they represent the foundation of the marine food web. Additionally, marine phytoplankton contribute between 20 percent and 40 percent of the oxygen produced on Earth. If you enjoy breathing, thank a diatom, since they created the oxygen in every third breath we take! 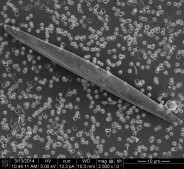 A photo of Pseudo-nitzschia taken with a scanning electron microscope. However, when some species of phytoplankton reproduce out-of-control, they create a “bloom” that can have severe negative impacts on the environment. For instance, some marine algae can reproduce in such numbers that they kill fish by clogging their gills, or by reducing oxygen levels in the water to levels too low to sustain life. Additionally, some common phytoplankton in the US, such as Pseudo-nitzchia spp. or Alexandrium catenella, produce toxins that can poison marine organisms and birds, and even humans. Predicting HABs can be difficult, as researchers are still investigating the many factors that seem to lead to a harmful bloom. Presence of fertilizers and warmer seasonal weather appear to be major factors, but the more nuanced causes are still being discovered. As well as detecting early warning signs of a bloom, an ESP can also help determine what causes specific blooms by taking regular samples. Information collected by the ESP, such as water temperature and nutrient concentrations preceding a bloom, may hold helpful clues as to what environmental changes are conducive to a bloom. How is the ESP helping scientists research HABs? Watch a time-lapse of an ESP deployment off the coast of Washington. Courtesy Stephanie Moore. Aquaculture, specifically shellfish farming, contributes approximately $180 million a year to local economies along the coasts of Washington and Oregon. Because of circulation patterns in the Pacific Ocean, a large rotating mass of water exists northwest of Washington known as the Juan de Fuca eddy. Within this eddy are cells of the harmful algae, Pseudo-nitzschia spp. Each summer, cells are periodically shed from this eddy, and travel down the west coast of the US, oftentimes blooming and producing toxin, wreaking havoc on shellfish harvesting. 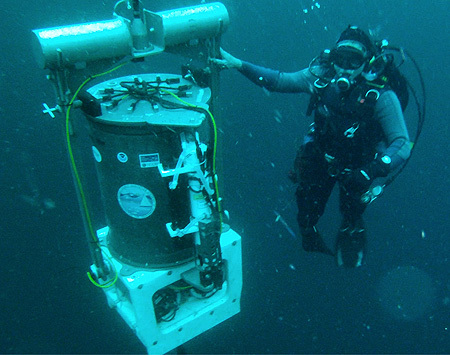 MBARI, the Northwest Fisheries Science Center (NWFSC; a division of NOAA), and the University of Washington’s Applied Physics Lab formed a collaboration to test whether the ESP could be used as an early warning device for these Pseudo-nitzschia cells before they arrive at shellfish areas farther downstream. This demonstration is ending with a final deployment in Fall 2017. Read more at the Northwest Fisheries Science Center website. 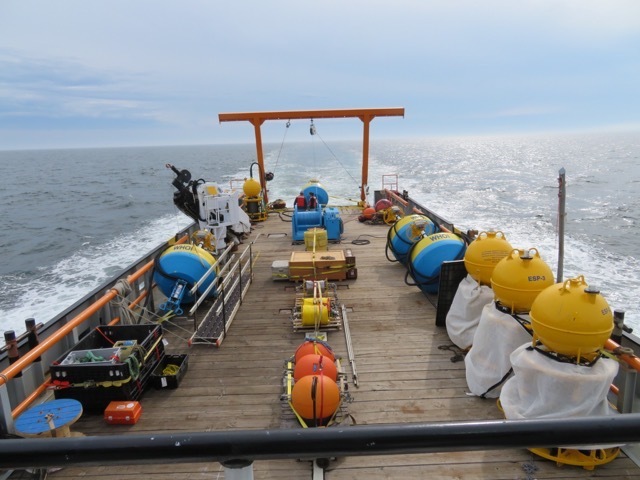 Heading for the deployment of four ESPs in the Gulf of Maine aboard the Woods Hole Oceanographic Institution ship the R/V Tioga. Photo courtesy of Bruce Keafer. Every year a red tide spreads from Maine to Massachusetts, caused by large numbers of the dinoflagellate Alexandrium catenella. Although a regular occurrence, these blooms vary in their exact timing each year. 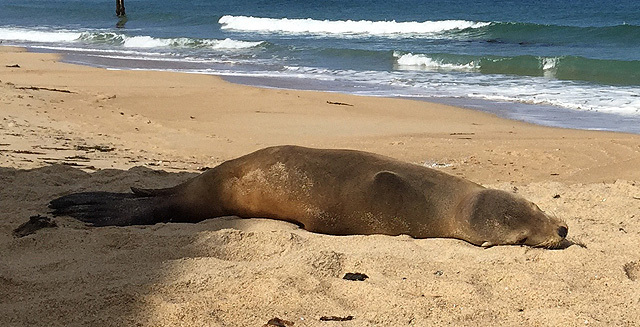 At Woods Hole Oceanographic Institution, a network of four ESPs have been monitoring this yearly event, hoping to catch the start and progress of the annual red tide. Researchers are hopeful that eventually the ESP network will be extensive enough to serve as an open-access resource to shellfishery managers. By checking ESPNet, state officials and resource managers could make informed decisions about when to harvest. Read more at the Woods Hole Oceanographic Institute website. In August 2014, the city of Toledo, Ohio, issued a warning to its half-million citizens that tap water taken from Lake Erie was temporarily unsafe for drinking, cooking, and showering. The cyanobacteria Microcystis, which produces the toxin microcystin, had bloomed in Lake Erie unexpectedly and, while the toxin is easily removed if managers are given enough warning, this bloom had not been caught quickly enough. The toxin had made it into the city of Toledo’s water system, and two days of flushing were required, meaning citizens of Toledo went without tap water in the meanwhile. To create a more advanced warning system for microcystin, the Great Lakes Environmental Research Laboratory (GLERL) purchased an ESP and collaborated with NOAA’s National Centers for Coastal Ocean Science who designed a biochemical assay to detect the microcystin toxin. This is the first freshwater use of the ESP, and a demonstration deployment is planned near the city of Toledo water intake for September 2017. Read more at the Great Lakes Environmental Research Laboratory website.